This post is a request from one of my closest friends who noticed how white my teeth have been lately. I was so glad to hear that because sometimes it's hard to tell if your own teeth are white! I'm currently 7 months pregnant - so I haven't been able to professionally bleach my teeth and have even stayed away from my trusty Crest White Strips. I'm not sure that it's bad to use them - I have just chosen the better safe than sorry route! 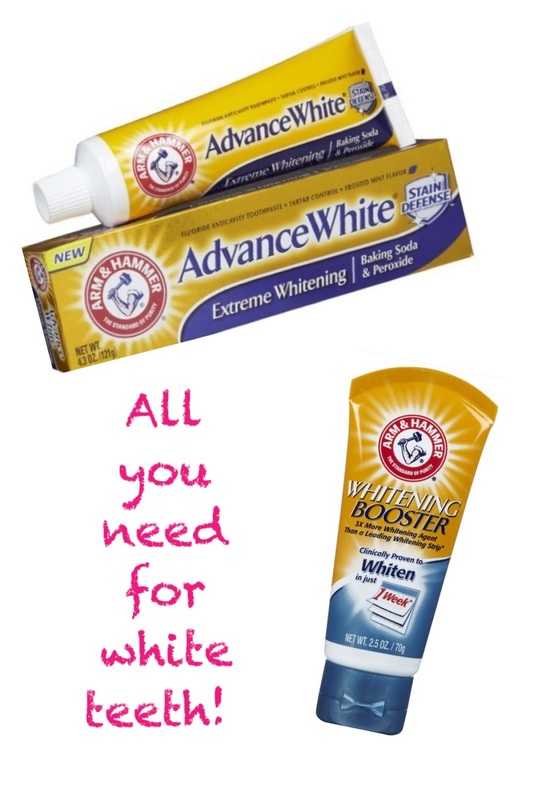 All I have been using is this Arm & Hammer Advance White Extreme Whitening toothpaste and that alone has really done wonders! Randomly, if I can remember, I will add the Arm & Hammer Whitening Booster directly on top of my toothpaste. It's as simple as that!! If I really get a wild hair I will mix a little baking soda & peroxide and brush with that - it's basically the same thing as the toothpaste though. If you're lazy like me with whitening - this is the best fix and it will make your teeth noticeably whiter.